What sparked this re-visitation? Firstly, in this post, a CH…O interaction in Z-DNA was identified using NCI, and its origins probed using NBO E2 perturbation energies, which revealed that the C-H bond was antiperiplanar to a C-O bond (effects 2 and 3 in that post), that could have the effect of acidifying the H, and making it more prone to hydrogen bond to the lone pair of an oxygen. Inspired by this, I worked out how to display NCI colour codes surfaces here on this blog using Jmol (previously, VMD had been used, which cannot be embedded in a blog). 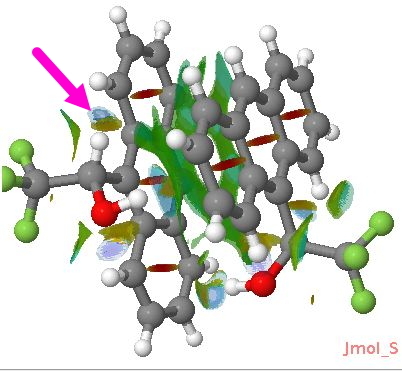 The H..H interaction previously alluded to is shown with a magenta arrow (between the two atoms with halos in the 3D model). The colour coding blue means it is distinctly attractive. In my (second) post, I did not mention why it might be special (and also the colour coding covered a large range, which meant the blue tinge did not really stand out visually). Why might that interaction be significant? Well, the C-H bond is perfectly aligned with the C-F σ* orbital. The NBO E2 energy is 3.9 kcal/mol, which represents a modest acidification of the hydrogen. You may notice from the above other blue regions. Click on the diagram, and go explore them. 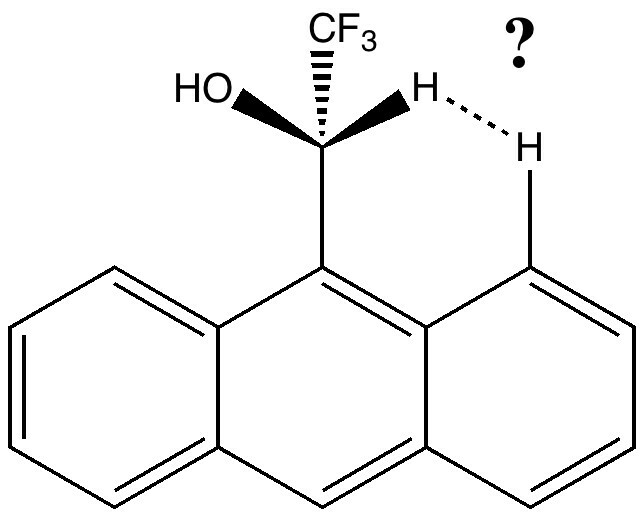 The history of this molecule is such that it is bound to hold more surprises! This entry was posted on Wednesday, May 25th, 2011 at 2:57 pm and is filed under Interesting chemistry. You can follow any responses to this entry through the RSS 2.0 feed. You can leave a response, or trackback from your own site.